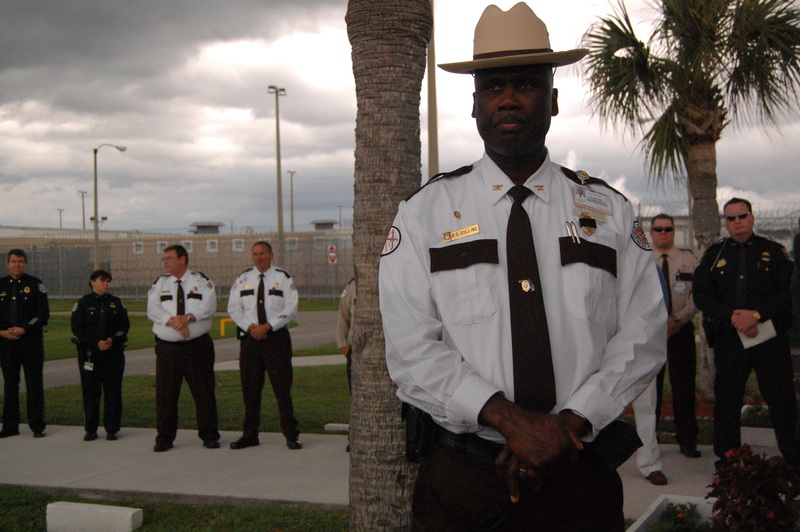 Col. Darryl Collins, chief of security at the Charlotte Correctional Institution, and other deputies from across the county took a few moments Tuesday evening to remember Darla Lathrem, a corrections officer who was killed in 2003. PUNTA GORDA — Lightning struck all around the perimeter of Charlotte Correctional Institution Tuesday evening. There was no lapse in time before the thunder arrived. The storm was already there. Thunder roared as Gerald Burns, a former corrections officer at the facility, related the horrific murder scene he witnessed at the prison a decade ago. Burns was speaking at a memorial service for Darla Lathrem, a corrections officer who was just 38 years old when she was murdered at the Charlotte County prison on June 11, 2003. Each year, the prison holds a memorial service on the anniversary of her death. Rain began pouring down when Nancy Behrens, another former corrections officer on duty at the time of Lathrem’s death, came forward to speak about her co-worker. Behrens said she will never be the same after what she saw that night. Her face was soaked with rain and tears as she spoke. Lathrem was supervising five inmates on a construction detail inside the facility when she and inmate Charles Fuston were attacked and killed during a botched escape attempt by three inmates, Dwight Eaglin, Stephen Smith and Michael Jones. Eaglin and Smith are now on death row. Jones took a plea deal in exchange for life in prison, and later died while incarcerated. The dozens of people in attendance Tuesday could barely hear Lathrem’s father, David Lathrem, a Baptist minister, over the rumble of the thunder as he delivered an invocation. Darla Lathrem was the first officer to be killed at CCI, and the first female correctional officer killed in Florida. Burns said he made a promise to David the day after Darla’s murder: He would make sure a memorial was put in front of the prison in her honor. That memorial, a marble bench with Darla’s name engraved on it, was covered in fresh flowers, and someone had placed a rosary and a cross on it. All the items were soaked with rain during the ceremony. While the droplets poured, no officer in attendance made a move for shelter. They just stood there, soaked to the bone, while honoring their fallen friend. Richard Johnson, assistant warden at the prison, apologized to guests for the weather. Darla’s family, however, seemed to see the stormy weather as a good omen. Best said she took it as a sign her younger sister was looking down on the remembrance. Darla’s other sister, Carol Miller, said their mother tried to convince Darla that she shouldn’t take the position, but Darla didn’t listen. ‘You know, even after she was killed, they would ask for her and ask where she was,’ Miller said. All of Darla’s family seemed to be in good spirits during the event.